Bridgewater Associates, the most successful hedge fund in the world, recently highlighted a 2016 study by McKinsey & Company that analysed what industries are most susceptible to automation. Jobs with lots of manual labour in a predictable environment could see higher automation in the years to come, while jobs involving managing human employees are likely safe for now. Bridgewater Associates, the massive hedge fund founded by legendary investor Ray Dalio, just released a report on the changing relationship between labour and capital in the US. One of the big factors the Bridgewater authors highlighted was the ongoing rise in automation across industries, which they noted could be a support for corporate profits in the years to come as more efficient robots and software potentially replace slower and error-prone human labour. 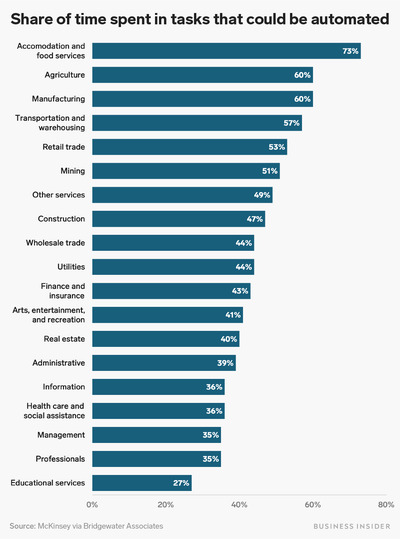 The McKinsey report used data from the Department of Labour to estimate how much time workers in various industry sectors spent doing different types of tasks, and which of those tasks could, theoretically, be automated using present technology. McKinsey noted that tasks like physical labour in a predictable environment, like a fast-food restaurant or a factory assembly line, and basic data processing, like tracking payroll accounting, could easily be automated using the robots and software available to us now. Other economic and social concerns, like the cost of labour relative to new investment in advanced machines and the public’s willingness to have robots do things like serve them food, are likely to be big factors in whether or not various jobs and tasks actually do become automated, according to the report.